Carpet has long been one of the most significant decorative elements. Practically in any house there will be a place for him – in the living room, bedroom or office. But not only because of its functional advantages, carpets are so popular. Modern technologies and production methods have expanded the range of possibilities so much that the aesthetic appearance of carpets can satisfy a connoisseur with any taste preferences. If you intend to buy a carpet in the near future, we advise you to do this with the help of our recommendations. Here are a few principles that should guide the choice of this product. Health first. Therefore, when choosing a carpet, be sure to check whether people living in the house are allergic. If not – you have no restrictions, feel free to go to the second paragraph. Otherwise, either buy exclusively synthetic and silk carpets, or generally refrain from this kind of decor. In order for the carpet to be appropriate and last as long as possible, you need to take into account exactly which zone it will be located. For the living room and the nursery, choose low-nap carpets, as they are more resistant to abrasion. In addition, the traces of the furniture on them are not so noticeable. For the bedroom, you can choose soft woolen carpets with a long pile, covering the entire floor space. Such carpets create comfort and suppress various noises. You can also decorate the bedside space with soft rugs. For the hallway, select artificial carpets, preferably rubber-based: they are more resistant to abrasion than others. By the way, the drawing on such a carpet very well hides traces of pollution, which is important for the hallway. Lovers of comfort in the bathroom can be advised cotton, quilted and synthetic mats with foam rubber base. 3. Decide on a style. Oddly enough, with carpets all the rules of combinations are very conditional. In fact, you can use any direction carpet in any style. And from such unusual combinations the interior will benefit. 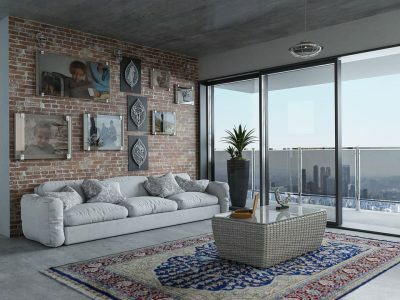 If you are an adherent of the traditional approach, then combine the classics with the modern style and lay oriental carpets in themed interiors. 4. Choose a color range. Now that you have already decided what kind of carpet you need for all the characteristics, it’s time to go to the color scheme. The carpet can be an accent in the interior, or maybe just a background. That is why you determine the degree of its significance. If a room is, say, monochrome, a carpet is a great chance to add colors and contrasts to it. If on the contrary – the room is not devoid of color gradations and transitions, perhaps in terms of the color of the carpet you should refrain from experiments, so as not to overload the interior. 5. Pay attention to quality. Remember that the inside of the handmade carpet must completely repeat the pattern of the front side. In addition, all such carpets have small defects (some asymmetry or irregular shape – which is sometimes done on purpose, in order to point out once again that this is truly a unique manual labor.